A wedding ring and an engagement ring are symbols of love and oneness of the couple. 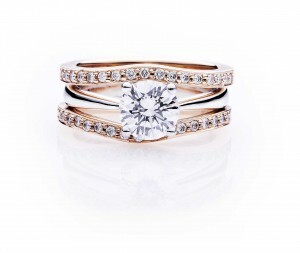 Until today, couple rings made of gold is the most popular type of wedding bands. Ling Jewellery is one of the popular jewellery shops in Singapore that specializes in gold ring making. Aside from the popular gold ring, there are many more popular types of wedding rings in Singapore which has equal beauty with that of gold rings. What are they? Read on and find out. The most popular type of wedding ring. This is also the most popular choice for an engagement ring. There are different shades of gold to choose from, like white, green or rose. This metal is measured in karats and the purest one measures 24 karats. However, for customised wedding bands by Ling in Singapore there are some jewellers that don’t advice to mold your ring with the purest gold, because malleability and softness. It is best to mix the metal with some other material, like silver, to give your wedding or proposal ring strength and durability. One of the popular choices by couples in Singapore. This metal has white luster that does not easily tarnish or fade. So you’re confident to wear the ring for many years without worrying about its durability and discoloration. Moreover, wearing platinum wedding ring doesn’t cause any skin reaction. Therefore, this material is ideal to couples with sensitive skins. Another type of material for wedding bands. This material has the same durability with platinum, but with very light weight. The hardness and strength helps prevent damage and scratches. If you like a proposal ring for your fiancé-to-be that is light enough for her, then this metal is what you’re looking for. Titanium rings also have different colours. The original titanium ring is a white metal with greyish undertone. To add colour, the ring must undergo an anodizing process with colour treatment. You might have found the perfect ring in one of the most popular jewellery stores in town, but you realize you don’t have enough money to own that impeccable ring of forever. Why not make a copy of it added with personal touches in very reasonable price? This is called customized rings. 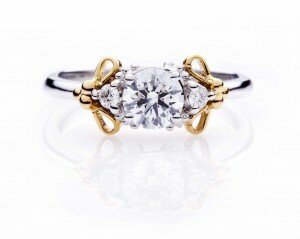 Custom wedding rings are gaining more popularity nowadays because of its highly personalized feature. You can add engraved messages or your name and your fiancé’s name. You can also choose the type of material and the stones to use in making your most dreamed of wedding bands.